For the day job I’m in the middle of writing about how locally manufactured product is going to be even more important going forward, as consumers think carefully about buying stuff that helps support locally based factories and craftstmen. 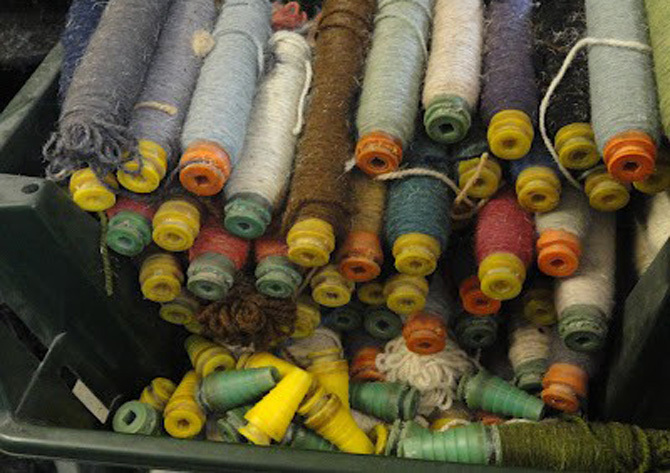 So when I went to Solva Woollen Mill in Pembrokeshire at the Easter weekend, I was hopping up and down for joy at discovering a thriving local carpet business with gorgeous things to buy. 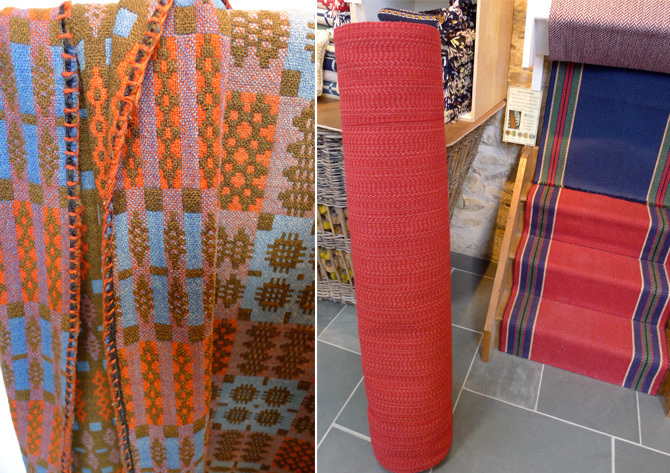 Solva is run by Tom and Anna Grime, who took over from Tom’s dad as weavers of beautiful flat-weave stair runners and rugs, Tom and his parents took over from Betty & Eric Hemmingway – Betty being the daughter of Tom Griffiths who built the mill. The mill was established in 1907, when there were over 26 weaving mills in Pembrokeshire alone, now there are just two left, with Solva being the only one making carpets. But what was a labour of love for the pair has now turned into a successful business, as Anna told us that in the last few years customers have searched out local, good quality makers rather than going abroad and they now supply Labour & Wait, Toast, Tobias and the Angel and work with designers Vanessa Arbuthnott and Ian Mankin. All this on top of orders for their increasingly popular colourful stair runners and rugs (they also provide Prince Charles with all the rugs for his Welsh house). The stair runners are fabulous, soft, thick woven wool (all from the UK) in colourful stripes and herringbones which are hard wearing, reversable and very well priced compared to other smart designer brands doing the same thing. The rugs, made from the same flat weave fabric are perfect for throwing on polished floorboards and can be made bespoke to your needs, if you are interested you need to check the website or phone Anna and Tom, who are delightful and immensely knowledgable. If you are in Pembrokeshire over the summer than make sure you visit the shop and tea room (excellent Welsh cakes) which Anna has stocked with lovely stuff made by other local weavers from Wales and Scotland including Harris Tweed, to support and promote their work too, she feels really strongly that all UK weavers need the support and recognition. You can then marvel at the ancient machines (Dobcross looms designed in the 1880s) and watch the materiel magically appear from a tangle of threads. Wonderful stuff, thank goodness Solva is still there, just think of all the other Welsh, Scottish and English skilled weavers and spinners who have since disappeared, it makes you want to cry. 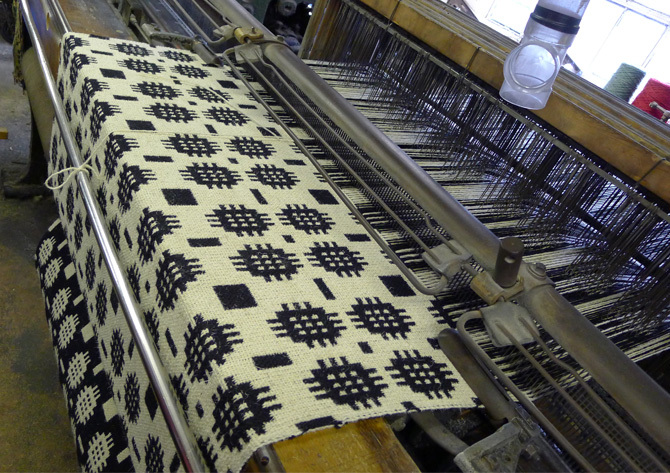 This is a very traditional Welsh pattern, above, which still sells well in floor rugs. 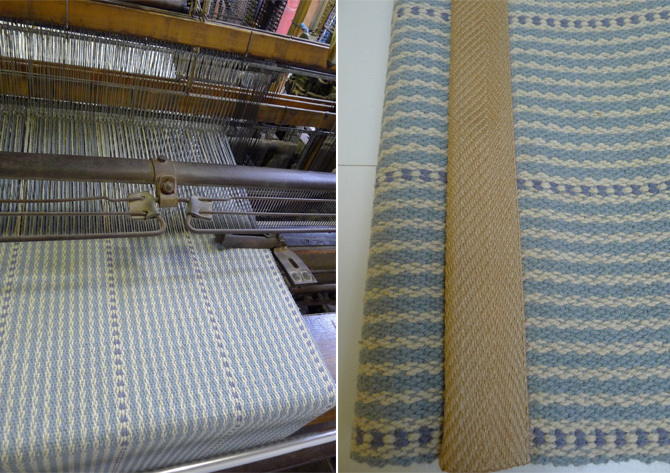 The left hand rug above is a vintage weave, made by the original owner of the mill in the early 1900s, the right shows my fav stair runner colours, although there are loads of variations to chose from. 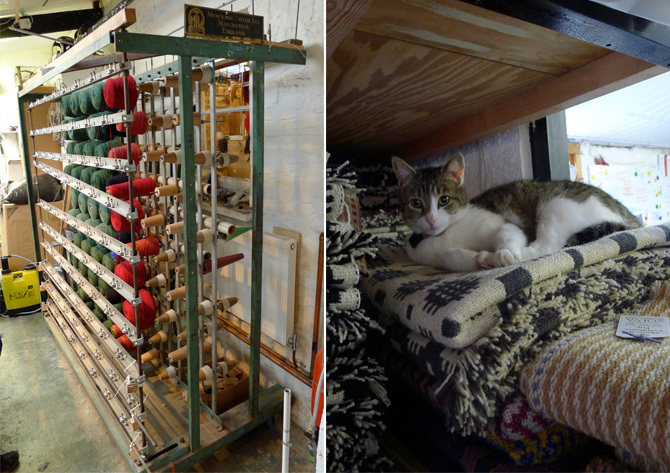 The retail cat has a pretty comfy time of it sitting on piled up rugs and on the left is the warp thread ready for threading onto the warp winding machine. This is the view from the Mill, on a wet, Easter Monday and it still looks wonderful, oh to have a work outlook like this. 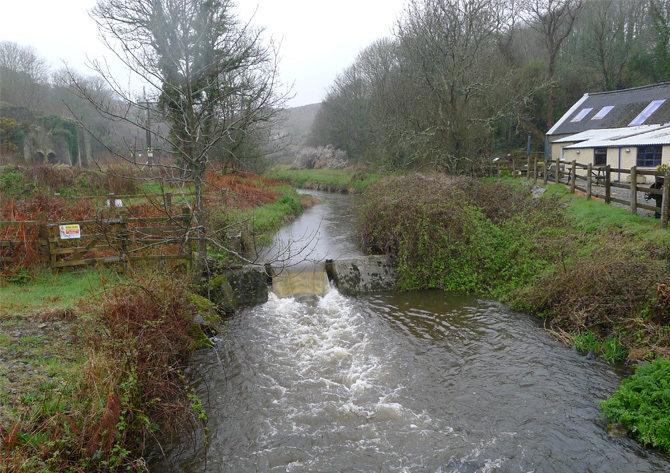 Solver Woollen Mill is in Pembrokeshire, Wales, all details on the website here. Cheaper than Roger Oates? When we had our loft done I had all the stairs and landings done in a beautiful R.O wool stair runner supplied (wholesale) by my lovely neighbour who has a carpet business and he also arranged for R.O’s best fitter to come and fit it (almost cost more than the runner itself). 5 years on (almost) it still looks as good as the day it was fitted (apart from a small tea stain, my fault, sadly). I will be campaigning for him to stock Solva if at all possible. I am very proud to say that I have a bespoke stair runner from Solva Woollen Mill and love it so much. 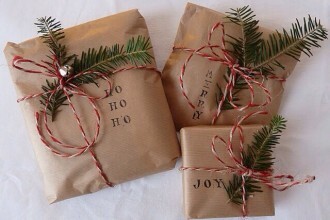 The satisfaction of buying from a local business, that I have visited for more than 35 years, is immense. (I remember the previous owners from when I was a small child holidaying in Pembrokeshire.) Tom and Anna are lovely people and have worked very hard to bring the mill on, with beautiful designs fit for the 21 Century, yet respecting the heritage and the traditions of their industry. I’m very happy for Tom and Anna to see the word being spread; Solva Mill is a small business and the runners are made with a great deal of care on those old looms, so expect to wait patiently but in happy expectation for your little piece of Wales.